Oh man my heart is still aching from this novel. I'm going to keep this as spoiler free as possible while I attempt to portray just how freaking amazing it is. I had seen this book floating around and I wasn't sure what it was about. As you all know, it was made into a movie and it wasn't until after I watched the trailer that I knew I needed to get my hands on this book. I was not disappointed one bit. All of the characters were so well written and constructed, and I feel like this is the first time that I still strongly remember each one individually days after finishing the book. Each was unique and brought their own piece to the story of Will and Lou. Even though the story revolved around the relationship between WIll and Lou, the other characters had their own issues and struggles during the book. I felt like Jojo did a fantastic job with not cutting corners with her character development and that made this book stand out from so many other novels. 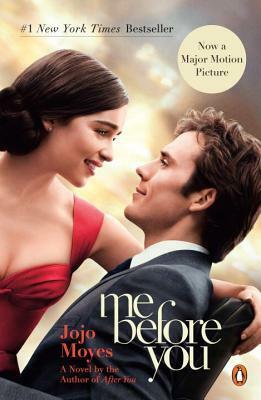 Me Before You not only told a fantastic love story, but it was also able to shine light on how those with disabilities are forced to live their lives. You saw how Will, Lou, and Nathan (his nurse) ran into struggles doing things that you and I wouldn't even think twice about. How much you have to worry about and how many obstacles appear. This story is extremely eye opening when it comes to disabilities and I applaud Jojo for giving a stage for the issue. This instantly made my list of all time favorite books and I look forward to picking up more of Jojo's other novels. Me Before You is definitely worthy of the hype right now.